I love celebrating the Fourth of July! What could be better than a barbecue surrounded by family and friends, great food and conversation followed by a spectacular fireworks show! What better way to bring this all together than creating a beautiful table setting to gather around. I used the traditional theme of red, white and blue in a new unexpected way. Polka Dots and Stripes. I wanted to create an all American tablescape. 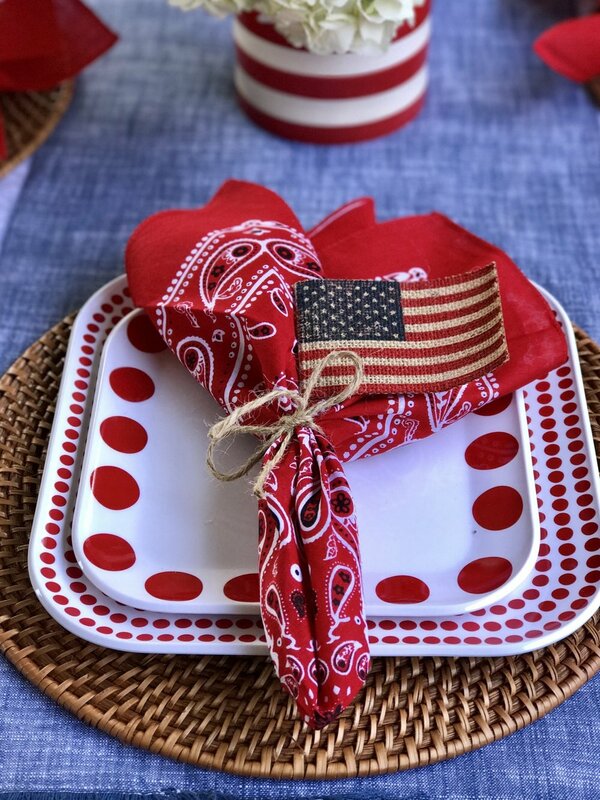 The inspiration for my 4th of July table setting came as I was wandering aimlessly through the aisles of the dollar bin at Target. I was walking through the dollar section when I came across a simple but beautiful red and white ceramic vase. The rest is history. Enjoy! For the centerpieces I shopped at my local flower shop Mr. B's Flowers. They have a large selection of flowers to choose from and they are always fresh. I choose Hydrangeas, Alstroemeria, and Spray Mums since they look like a firework; all in white. To highlight the red accents I chose red roses in the small vases. Have fun creating your own 4th of July gathering. Wishing you and yours a wonderful fireworks filled day!